Working together - Coun Margaret Sherry, Coun Rachel Jenkins and chair of the Worcestershire branch of the Motor Neurone Disease Association Anita Sharma-James. 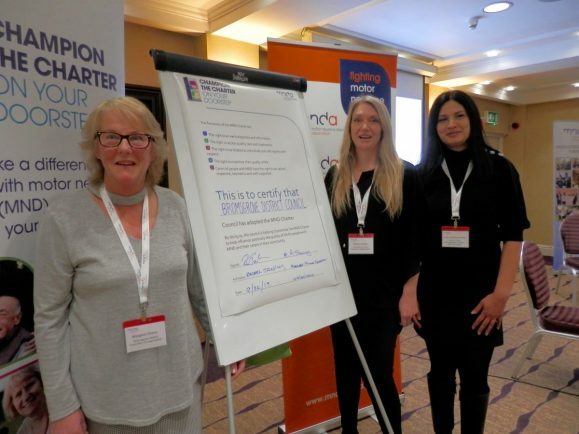 BROMSGROVE District Council has adopted the motor neurone disease (MND) charter in support of local people living with the disease and their carers. Many people are not receiving the care and support they need because very little is understood about MND. The charter was launched to help change this and acts as a commitment from the council to provide quality care in Bromsgrove. It was signed by Deputy Leader of the Council Karen May, Coun Rachel Jenkins and Coun Margaret Sherry at the Holiday Inn Bromsgrove last Friday. Coun Jenkins, who first proposed the motion to adopt the charter at Bromsgrove’s Full Council Meeting last month, said: “Our aim is to raise awareness of MND and what good care can look like. “We will do everything we can to positively influence the quality of life for local people and their carers living in our community. Coun Jenkins worked closely with one of her constituents Martin Benbow, whose father died of the disease, to learn as much as she could about MND. She also brought the MND charter motion before Worcestershire County Council, which was also adopted, when she was a County Councillor. “I’m delighted with the news,” said Martin Benbow. Bromsgrove resident Liam, who is currently living with MND, says it’s not fair people die without having a suitable wheelchair or the right support system in place to communicate. “We have got to stop the ignorance surrounding this disease by making sure diagnosed patients have access to the right services,” he said. MND is a fatal, rapidly progressing disease which kills around a third of people within a year of diagnosis and more than half within two years.